This week I'm traveling in the former Confederacy. On Thursday I'll be giving the Miller Lecture at Georgia State University College of Law. Today, I'm at Tulane University Law School, giving the annual McGlinchey Lecture on Federal Litigation. The title of my lecture today is "Cases, Controversies and Cartesian Dualism." 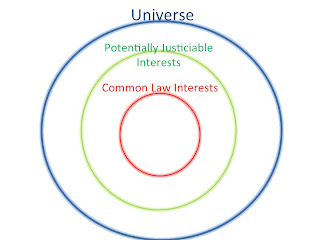 In it, I analyze a puzzle that has been part of the Supreme Court's standing doctrine at least since 1992, when Justice Kennedy, concurring in the Lujan case, said the following: “Congress has the power to define injuries and articulate chains of causation that will give rise to a case or controversy where none existed before, and I do not read the Court's opinion to suggest a contrary view.” That view effectively became the law because the majority opinion in Massachusetts v. EPA more or less treated Justice Kennedy's Lujan concurrence as authoritative. The thick, outer blue line represents the boundary of the universe of all space-time events that have ever or will ever occur (in two dimensions). If that's too weird a notion for you, just think of it as every event you can imagine. The inner red circle is the boundary of the sorts of injuries that are protected by the common law. An example might be: D breaches his contract with P by failing to deliver promised goods. Another would be: D punches P in the nose. 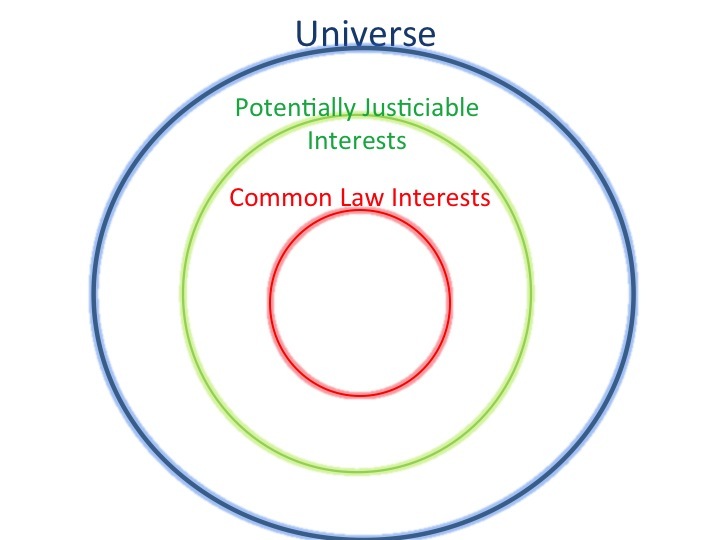 The point is that anything that allegedly happens and can be characterized as falling within the inner red circle clearly gives rise to a justiciable case or controversy. Here's a relatively easy case: Congress can create a right to information where the common law did not recognize one. Then, the denial of that information counts as an Article III injury. That's the holding of FEC v. Akins. We also know that Congress can't create a freestanding "right to sue," as in Lujan itself. But can Congress always find a way around that limitation, so that the green circle effectively bumps up against the blue circle? What if, in Lujan, instead of a right to sue, Congress had conferred on every citizen a "right to live in a world of biodiversity"? Then harms to an endangered species would amount to injuries to anyone anywhere. I'm pretty confident that the Court would reject such an injury, but the question is why. I include "Cartesian dualism" in the title of my talk because some of the Court's rhetoric in standing cases sounds as though the Court treats psychic injuries as less real than physical or pocketbook injuries. In the end, I suggest that the Court's standing sticklers--who tend to be conservatives these days, as illustrated by last week's ruling in Clapper v. Amnesty Int'l USA--are really concerned about separation of powers and the unitary executive. These may be legitimate concerns, I say, but the metaphysics of what counts as an "injury" are not a very good proxy for them. Accordingly, I end up pretty critical of the doctrine. That view effectively became the law because the majority opinion in Massachusetts v.http://theclearwaterattorney.com/clearwater-divorce-lawyer EPA more or less treated Justice Kennedy's Lujan concurrence as authoritative. In the same way, Unidentified makes an important point about the extra expenses of Diablo 3 Gold the facilities necessary to back up a ground development. Those expenses, however, would seem to vary extremely among the appropriate educational institutions to Runescape Gold . USC certainly encounters much greater expenses to deal with vehicle parking, visitors, bathrooms, etc., than does UGA or Bama. Yet we see consistency with Guild Wars 2 Gold, not distinction, in the main point here. bumps up against the blue circle? What if, in Lujan, instead of a right to sue, Congress had conferred on every citizen a "right to live in a world of biodiversity"? Then harms to an endangered species would amount to injuries to anyone anywhere. It's very interesting thatIphone 4 case you showed this one. woah! men and women colors! these shades! and also a attractive silhouette manufactured naruto cosplay costumes by clothes... i like it!Nowadays I want a number of mirrored eyeglasses!! !